For reports concerning this animal attack see Big Cat Fear As Mystery Beast Bites Woman, Crofter Is Attacked By Big Cat, Woman bitten by mystery 'black beastie', Woman is attacked by 'Big Cat', Experts Call For More Evidence To Identify Mystery 'Black Beastie', 'Whatever it was I don't know. But this was no pussycat' 20 th January 2002, The Big Cats are out there - all 150 of them, I Was Bitten By The Big Cat In Big Yin Country, Beasts on the prowl and Attack By Mysterious Beast Inspires Poetic Victim To Put Pen To Paper. We are indebted to Doris Moore for the photographs. This lady (in her 50s) had an uncomfortably close encounter with a animal of some sort (reported as a big cat) last Friday evening, around 9pm. She had been to visit the steading where her horses are stabled, and had been there around 30 minutes, feeding, cleaning, stabling them, including moving hay from the barn, which has one side open to the elements. As she finished her work, and left the stable to walk back to her car, she heard a low "whistling" noise, felt a tugging around her heel - her initial thought was that her trailing elasticated strap for her jodhpurs had snagged on something. She tugged it free and moved on, and the same thing happened: when she looked around this time she saw a dark animal pulling at her, and in panic she hit it across the head with her car keys, at which point it bit her on the thigh. She believes it bit her once (I'll discuss this later) and held on whilst she opened her car and fell inside, at which point it ran off. The elderly gentleman with her (81 years old) is positive it was a cat and described it as being 16-18" high, 30" long plus a tail, and dark, with a small head relative to the body. When I met Doris she was initially very cagey and clearly still upset, both by the incident, and the response of her community, who have largely laughed at her. She became much more trusting over time, as I explained my own sighting and assured her that she wasn't mad, just unfortunate in her experience, and also that the group is trying to put big cat research on a scientific basis (she mentioned that apart from press, some man who described himself as a big cat researcher had phoned her and been quite rude when she said she wasn't sure if she wanted to talk about it, because he was aggressive and didn't want to listen to her story). We visited the stables and looked at the ground, but with snow melted no sign of anything, nor in the barn itself: as we walked I asked her questions, trying to check details for inconsistencies. Her story remained consistent, the details she gave didn't change, and her confusion on things she didn't know was apparent. She did mention that she had seen something around 2 years ago one spring, and had found large prints last year but as I am going back on Monday I will develop these details later - she has promised to dig out the photos of the prints, an added bonus, as was the fairly standard earlier sighting. 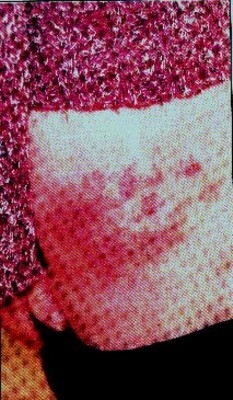 I have a copy of a photo of the woman's leg which is unfortunately of poor quality, but clearly shows bite marks. This woman has I believe been genuinely attacked by an animal of some sort, and is not hoaxing. Whether it was a cat is far from clear, but she is not deliberately misleading us. She also handles animals regularly (she has horses, goats, geese and three dogs herself, and walks black labs for a part-time job) so would seem to know a dog from a cat, although by her own admission the perspective & situation were not ideal! The attack itself is puzzling - the silent nature would suggest a cat more than a dog (I have never seen a dog attack without barking), but there is a complete absence of scratch wounds from claws. 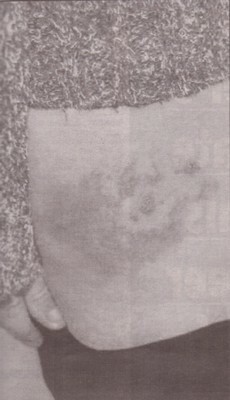 The bite itself shows three puncture wounds which appear in a rectangular pattern measuring 10 x 7.5cm - if that were one bit it would be a very large animal, far larger than the size suggested. I do think that there would be several separate (perhaps overlapping?) bites. There is severe bruising around each puncture and one of them appears to shows some additional damage as if the jaw had been worked in a chewing fashion (not certain here but that's how it looks). The area does have Kellas cats within 2 - 3 miles (Mike Inglis can confirm) which the woman is familiar with. These animals can be ferocious for their size but the size reported would to my mind be larger end of scale for a Kellas. It is also in the area which in 1980's & early 90's was described as "Beast of Bennachie" country. My guess would be this was in fact a dog but it is not possible to preclude cat from the evidence, although there are some puzzling aspects such as lack of use of claws. That said, the silence would be unusual for a dog. It seems to have been narrowed down to a mink, badger, wolverine, otter, pine marten, fox, or dog. It probably is less important what the animal was, than what it wasnt, and that is cat. So, whether everyone agrees as to what attacked Doris Moore, I think the group has deduced that it wasnt a cat, large or small. Having met Doris twice now, as well as Wilf (the elderly gentleman who actually saw the animal) I have to say her story has not changed in one single detail, nor has Wilf's. Wilf has not used the word cat to me - he has only ever used the word "beastie" and described the animal as being 16-18" tall x 24-30" long plus tail. He said it was dark. He also said the legs seemed fairly long, which would seem to rule out the mustelids, unless he is mistaken. That said, I do not believe it was a cat - no claw marks at all. Because of the size, I would personally discount also mink & pine marten. Which leaves us with Dog & fox - given the absolute lack of growling/barking I would say not dog, but the hissing noise reported could be fox, which do seem to have an amazing range of vocalisations. Wilf & Doris have both seen Kellas cats (there is a group within 5 miles of them) and are adamant this was far larger than any Kellas they have seen. What I am convinced of is that something bit Doris, and once I have the photos developed I will put photos of the bites on the website for you. I don't claim to know the absolute answer but I am inclined to Ben's view that it wasn't a cat, and if we are to be taken seriously we have to look for reasons why an animal is a cat, just as much as reasons why. I suspect we'll never know for sure. 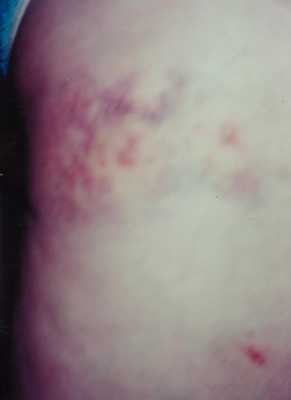 From the look of these pictures, it appears that the purported bite area is severely bruised, with only minimal punctures. This would seemingly be inconsistent with the more pointed and penetrable canines of a feline or mustelid. I would also think the bite itself was very painful. 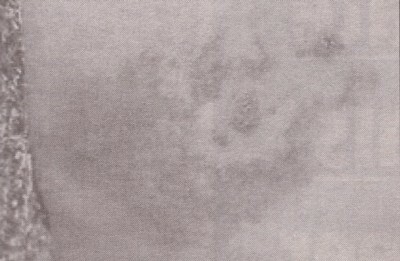 What appears to be extensive bruising in the surrounding area would indicate that there were multiple bites where the teeth didn't penetrate the fabric. I would have to say the likely suspects would be dog or fox, but more likely fox. Dogs rarely venture past their own domains to perpetrate such an attack and they are less likely to flee in such a mysterious fashion. It is fortunate that Doris Moore resisted the temptation of sensationalism in retelling the facts as they truly occured. Phil's report of the genuine facts were more professional than the professional journalists who elected to embellish what Doris Moore had accurately reported. Having followed this case for some time, I have to say that I am very impressed by the courage and the unchanging story of Ms Doris Moore. She seems to be a very credible witness. Despite the apparent doubt from some, Ms Moore has stuck to her story and avoided all attempts at sensationalism. I have no doubts whatsoever that Ms Moore was attacked by an animal of some kind. However, given the nature of the attack and the wounds inflicted, I am not entirely convinced that this animal was a cat, at least not a black leopard. There have been several suggestions that the "black sleekit beastie" which bit Ms Moore might have been a black fox which are apparently quite common in this area. This does seem to be a possibility which cannot be excluded. Mustelids ahve also been suggested. I also recall a sighting from near Carrbridge in 1998. Three of the witnesses described the animal as a "black panther". The fourth said that it was an otter. It seems that there is a stream close by to Ms Moore's house, so could it have been an otter which bit the lady? All I can say is having seen her and seen her leg at the time, I still believe she was totally honest in her dealings with us, and she was attacked by something. Equally I can say that this was not a big cat - if it were a single bite from a big cat (as she believed initially) the gap between canines of 4" would be a huge animal which would not have left minor scratches and bruising - it would have almost chewed her leg off! A typical leopard would have such a gap between teeth of 3 - 4" I believe and is easily capable of carrying a woman of Doris' size away. I believe it was a fox or a mustelid of some kind, explaining the faint hissing noise she heard - I and I believe she somehow caught it in the trailing heel-strap of her jodhpurs which brought on the "attack" as the animal sought to get away. I would also agree concerning the Doris Moore attack. Without regard to whatever her companion believes he saw, neither the incident nor the marks are consistent with any type cat. The bruising itself is evidence of an animal with either very short or dull teeth as opposed to the longer canines of a feline. Assuming the canines did penetrate the fabric or the skin, the punctures themselves would relieve any pressure of blood to the surface, which might cause a bruise. Rarely have I seen bruising as the result of a cat-bite. Furthermore, even a small cat with the claws attached are not so easily discouraged once they have attacked. I visited a local otter sanctuary on Saturday and was interested to hear that the little blighters will quite frequently nip humans on legs, feet etc. This ties in with the photographer who had been bitten by an otter as well as reporting a big cat sighting in the western highlands: there was speculation at the time of Doris Moore about whether an otter would bite a human, it seems they will happily do so with little provocation. Not sure if that is conclusive on DM but I still do not believe cat. I actually have more experience with mustelids than with cats and have experienced a number of nasty bites, some right down to the bone, over the years - most of which were my fault. Gavin Maxwell, who kept otters near Skye and wrote "Ring of Bright Water" was bitten on more than one occasion by his "pet" otters. Like felids, mustelids, even tame ones, have to be handled with a great deal of respect. P.S. It was nice of Ms Moore to phone you and thank you for the flowers that we sent her.